The latest in gun safe technology is the biometric safe. This advanced gun safe uses fingerprint recognition to unlock and can be an efficient, highly secure way to keep your valuables. The future of safes is fastly becoming associated with the use of a biometric fingerprint authentication technology to confirm access to the safe. Many of these safes allow for the storage of dozens to hundreds of unique fingerprints for safe access. The dark days of losing a key or forgetting a combination are quickly becoming things of the past with a growing smart safe technology. How Does the Biometric Safe Work? Biometric safes use human characteristics as identity markers for safe, reliable security. These safes work by allowing you to program sets of fingerprints--usually at different angles--into the safe. A digital sensor stores and recognizes the unique prints and this serves as the combination for the safe. Most safes allow you to program many different fingerprints into the safe for increased access and insurance in case you can’t open the safe with your own prints. While unlikely, burning, cutting, or otherwise damaging your fingers could result in a situation where someone else may need to open the safe. In this case, the biometric safe stores multiple fingerprints of authorized users in its memory. Besides having a safe that is decidedly more personalized, there are numerous tangible benefits to using a safe that opens through fingerprint recognition. Many people underestimate the potential for a safe to be broken into or stolen and think that the presence of a safe or it’s sheer size is enough. This is usually true, but a dedicated thief with time and tools could easily hack the lock or penetrate the safe security with axes, picks, and drills. What’s more, depending on your safe’s location, a thief could also just steal the entire safe. Because the combination is completely unique to your fingers, hacking a biometric safe is very difficult and unlikely to be effective. It most cases, this security system is a strong enough deterrent for a potential thief. 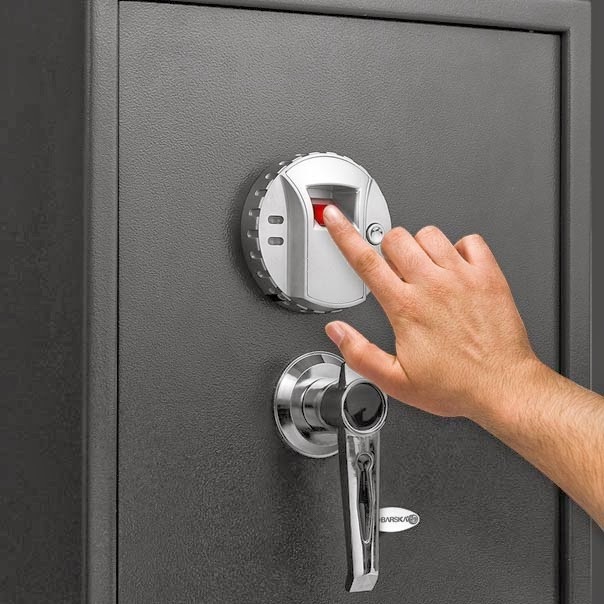 Depending on the sophistication of the safe, biometric safes may include a combination of traditional opening methods with biometric technology or may be entirely biometric with advanced recognition features. In these safes, a biometric combination is used and then followed by a manual combination to fully unlock the safe. The most common biometric identifier on a safe is the fingerprint scanner since it is easy to mount on the exterior, but advanced safes have other biometric security features. Things like iris scans, facial scans, voice recognition, and even DNA tests are all part of biometrics. Many of these features are used as security measures on safes with some safes employing a number of these technologies simultaneously to open the doors. Advanced safes can even be programmed to differentiate levels of access. Some highly technological safes can be programmed for admin access and a more general user access. For example, one user can reprogram the safe while another can only open the safe. The nature of the contents and environment will determine the level of security needed to secure the safe. Ben Vaughn works with www.cannonsafe.com and writes about the newest safe technology. Ben has recently purchased a gun safe for his home and is still trying to get the hang of all of the features.